A man was in custody Wednesday night after ramming into an Oakland police car and then leading police on a wild chase through the streets of Oakland and Berkeley, police said. 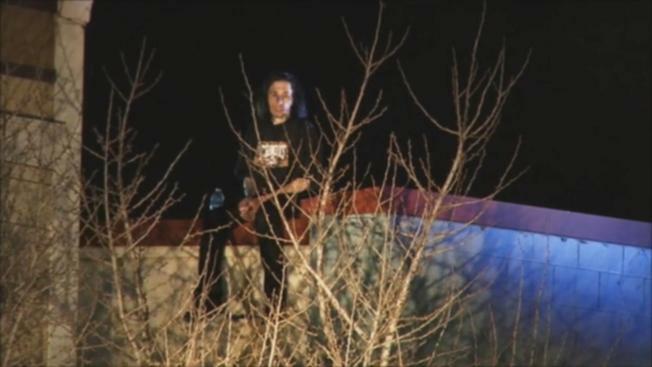 The vehicle chase ended wiith a collision at College and Ashby avenues in Berkeley, but the suspect fled on foot and made his way to a nearby rooftop, prompting a standoff. Police negotiated with the suspect for about 90 minutes before taking him into custody. The pursuit of a white pickup began when the driver smashed into an Oakland police patrol car near Lake Merritt, Berkeley police said. At around 6:50 p.m., an officer was chasing the suspect near 14th and Harrison streets in Oakland when the suspect rammed into the officer's patrol vehicle, according to an Oakland police dispatcher. Ermis Regassa said his wife was driving a black Chrysler involved in the collision at College and Ashby. She told her husband the pickup driver ran a red light. "She was freaked out," Regassa said. "She was scared." A woman in a nearby restaurant said there was a crash, and police were suddenly everywhere. "We saw people outside, cops outside with guns, and we ran into the back door, 20 of us in there," she said. "All the staff made sure we were OK. They locked all the doors and turn off the lights." The chase involved several patrol cars speeding through the streets of the East Bay cities and a helicopter buzzing overhead before it turned into a standoff at the busy Berkeley intersection. The intersection remained closed for an accident investigation, police said. NBC Bay Area's Terry McSweeney and Bay City News contributed to this report.